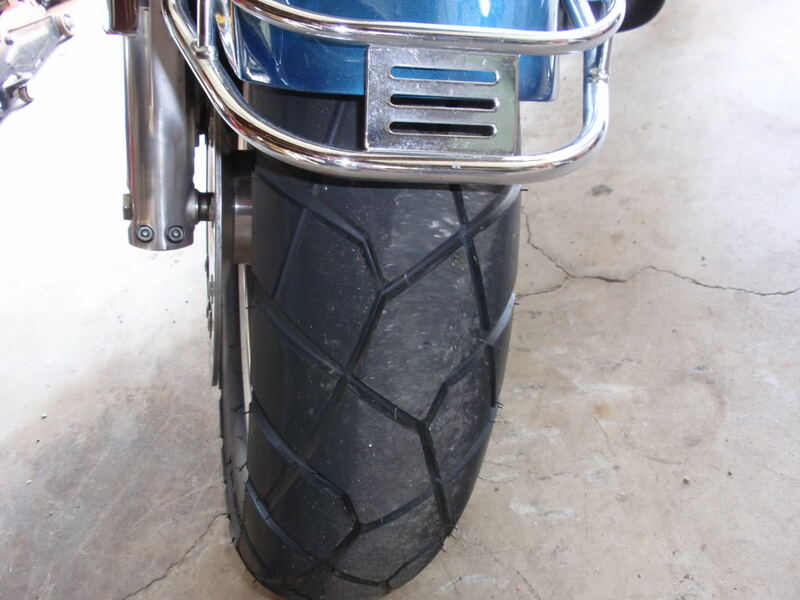 what other tire choices have been made and what successes and failures have folks experienced? this forum is great! i bought a General Acclaim 205/55R16 for the back of the interstate and i will get it installed before the season starts here in Canada. but i know i need a new front as well. Ok Breeze .... So now that you have given this Trail Wing tire a good try ..
How many miles did ya get out of it?? because of the riding-that-we-do, and I have no fearful conscience of the front not matching the rear's massive grip. It truly is an amazing tire, up there with Avons, well, except for the faster wear. But who cares, at that price? I'll follow the reports on that Wing, for sure. So Breeze how are you liking your tire??? And the Battle wing on my Green Valk ..
And after much thought and studying ..I'm reversing the tread..
Ok took a test ride on the Double dark side.. The new front has a little vibration from the tread..
HB tried he as well ..And he too said his new tread also has a little noise..